Just one day after announcing the XF10 premium compact camera, Fujifilm is back with a pair of decidedly higher-end announcements: Two new lenses for its X Series mirrorless cameras. The first is an ultra-wide 8-16mm zoom with a fixed f/2.8 aperture for landscapes and astrophotography, while the second is a huge 200mm f/2 telephoto prime suitable for low light action photography. Both new lenses feature linear focusing motors and weather resistance. The XF8-16mm F2.8 R LM WR provides a field of view equivalent to a 12-24mm full-frame lens and promises edge-to-edge sharpness and low field curvature, two common problems with ultra-wide-angle lenses. The optical construction is composed of 20 elements in 13 groups with four aspherical elements, six ED (Extra-low Dispersion) elements, and 3 super ED elements. It is built to be paired with Fujifilm’s weather-sealed camera bodies, like the X-H1 and X-T2, and is sealed at 11 points. All of this tech won’t come cheap, however, as the 8-16mm carries a price of $2,000, putting it up there with the most expensive XF glass. Availability is slated for late November. It is the XF200mm F2 R LM OIS WR that gets to claim the title of most expensive X Series lens, however. At $6,000, the only thing bigger than this behemoth prime is its price. That high cost is due to this being one of Fujifilm’s most advanced lens designs yet, featuring 19 elements in 14 groups with a unique large-diameter super ED element finished with a special polishing technique that Fujifilm developed for its broadcast lenses. The optics are housed in a magnesium alloy body that is weather sealed at 17 points and painted “matte silver” to reduce the chance of overheating in hot temperatures. The lens also benefits from an optical image stabilization system with a claimed 5 stops of shake reduction. A focus preset button instantly snaps the focus to a predetermined position, and the entire focusing group is locked in place when the camera is not in use to reduce unwanted changes in focus. With a 300mm full-frame equivalent field of view and a bright aperture, the lens combines telephoto reach with good low light capability, suitable for wildlife, sports, and theater and dance. 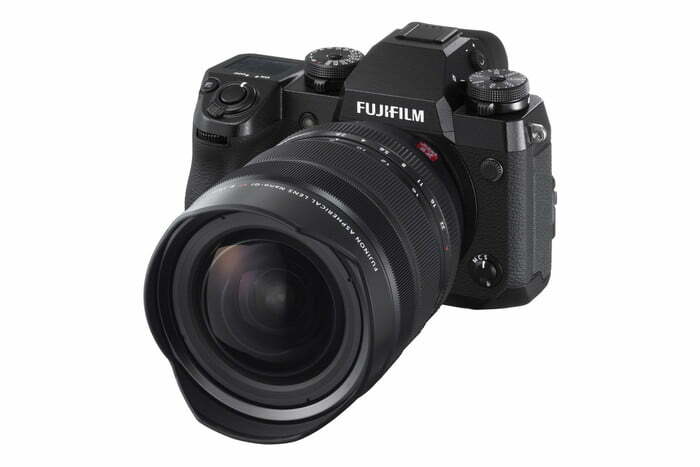 Fujifilm is selling the lens bundled with a new 1.4x teleconverter, pushing that reach to an equivalent 427mm. The XF200mm F2 should ship in late October. Also announced today was the addition of three lenses to the XF lens roadmap: The XF16mm F2.8 R WR, XF16-80mm F4 OIS R WR zoom, and XF33mm F1 R WR. Yes, you read that correctly, that’s an aperture rating of f/1.0 on that last one, which will make it the fastest first-party lens for any mirrorless system. Each of these new lenses also bears the WR designation for weather resistance, continuing Fujifilm’s trend of producing premium glass for use in all conditions. While the lens roadmap offers a look at what’s in the pipeline, products listed on it are still in development and have no pricing or availability information. However, we can safely assume that any lens with an f/1.0 maximum aperture will not come cheap, so start saving your pennies now.